There are many sports that people from all walks of life enjoy playing, yet few can be as competitive and speed-demanding as tennis. Tennis is a popular sport that millions of people enjoy watching and playing too. However, this game requires you to have the right gear if you are going to deliver any meaningful performance on the court. Whether you are an experienced tennis player use or just an amateur who wants to train in the best way, it is essential to use the best tennis shoes in order to enjoy as well as improve your gaming prowess. A quality pair will protect your ankles while reducing impacts that may cause tissue or muscle injury. It also offers great traction on the court while remaining lightweight to allow for speed, so you won’t be outsmarted by your opponent. 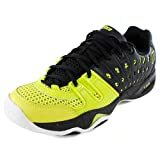 Plus the right fit and support among other vital features, the following top 10 best tennis shoes for men accrue the foregoing benefits and more. Read on to pinpoint your favorite pick for enhanced tennis gaming experience. ASICS is a renowned maker of sports shoes, and it doesn’t fall short in the production of tennis shoes. 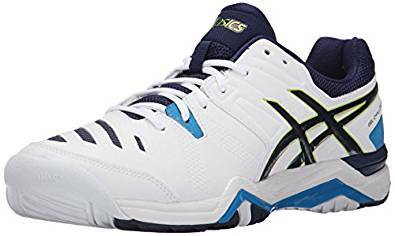 For instance, the new Gel-Challenger 10 is a top rated tennis shoe model that offers unique comfort due to its rearfoot and forefoot Gel cushioning systems. Because of its lateral propulsion truss-tic technology, it is a very stables shoe that also provides the ideal upper fit with is PHF fit system incorporated collar. Its modern design offers mid-foot support by the extended Flexion Fit forefoot, while the quality synthetic leather mid-foot brace ensures enhanced stability. As such, Gel-Challenger 10 is everyday tennis players’ choice. The Prince T22 is another great tennis shoe for men among the most popular models today. It is expertly crafted with a breathable blend of synthetic and mesh materials. It has a superbly cushioned PU sock liner and a super supportive TPU shank, while its PRC1000 outsole provides dynamic on-court traction. This shoe is built for incredible durability and also support while ensuring improved aeration to the foot. The forefoot TPU straps further add to stability, with the RASH toe cap offering abrasion and injury protection. Moreover, the Shock Eraser midsole absorb impacts excellently. 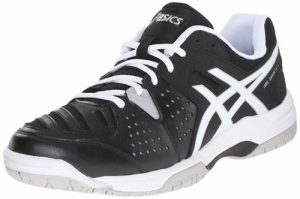 The Gel-Solution Speed 2 by ASICS ranks among the lighter tennis shoes for men today. It is designed to ensure proper ventilation to your foot, making it a great choice for summer matches. Its exterior is made of quality synthetic mesh. The top-grade rubber sole offers durability and traction, while a foam midsole ensures proper support and comfort. You will enjoy enhanced on-court tennis performance with this shoe. Moreover, it features full-length Flexion-Fit upper and PGuard toe protector for extra durability and safety. sneaker. Exhibiting a simple vibe, it’s easy court-inspired silhouette is just impressive. Three perforated stripes and unique branding make these men’s tennis shoes boast a clean and sleek style for inspired competitiveness. Adidas NEO Lifestyle is, therefore, a clean looking tennis shoe model made of quality synthetic leather upper and premium synthetic sole. 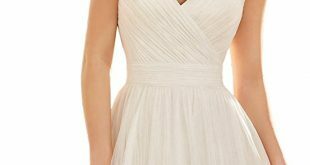 It features a soft textile lining and webbing detail around the heel for added support. 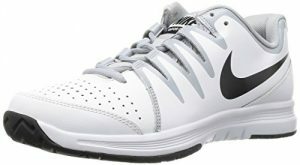 A new and improved version, the Nike’s Vapour Court men’s tennis shoe provides a comfortable fit and lightweight feel. Great for fast on-court dashes, it optimizes foot support and stability. A split synthetic and leather uppers offer comfort and style with a supple, flexible fit, while its great midsole ensures comfortable movement support. Its GDR rubber outsole has a herringbone pattern for incredible traction and also durability. It also delivers greater on-court traction for optimum track. When you choose the K-Swiss Men’s Bigshot, you have a durable quality leather tennis shoe with an improved Flow-Cool system for enhanced breathability and moisture management. The synthetic leather upper is also comfortable and secure, while the rubber sole is both durable and flexible for optimal traction and speed. The outsole is multi-directional for improved stability while fast-dashing across the court in a competitive game. It is a top-performance tennis shoe any man player will appreciate. It is also ideal for tennis trainees. 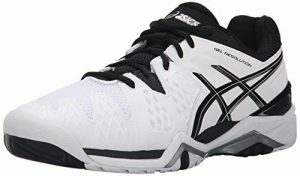 Although an entry-level model in the great ASICS tennis shoe line, the awesome Men’s Gel-Dedicate 4 brings unparalleled performance to the game. It features appreciable Forefoot GEL cushioning as well as mid-foot Truss-tic system, therefore delivering a rare combination of stability and comfort. Its solid rubber outsole is durable, while the flexible upper design offers the comfortable fit. As such, this is the ideal choice for players who do consistent games. Moreover, this shoe provides great ankle protection. With a durable all-leather body, it is a fit pick for both starters and experienced players. Any player who needs to do backhand slice and sneaky drop shots better than his opponent has the solution in the Barricade Team 4. 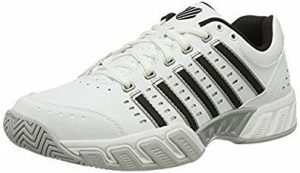 This shoe from the reputed Adidas offers the ideal secret for a technical yet aggressive tennis player. Its ADIPRENE+ foam inner sole is super responsive to support you perfectly for fast adept returns, while its durable ADIWEAR 6 outsole makes it stand against any abuse through the court. Featuring a design that offers optimal performance stability, the New Balance MC806 is one of the greatest tennis shoes for men. In clean pure white theme, it is made of quality synthetic and leather for durability, stability. It is comfortable, light, and boasts an ergonomic design for motion efficiency. This also has a reinforced, perforated comfortable toe box, while integrated side panel and special lace-up design ensures stable, custom fit for a flexible great gaming experience. This further features supportive C-CAP midsole, non-marking and durable outsole, and premium-grade ABZORB padding for greater comfort, support. When the game is tough, go smash it with the Gel-Resolution 6 from ASICS. 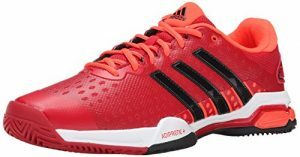 It is an ace among the best tennis shoes for men. It features improved PGuard toe protector and novel AHAR technology strategically positioned on the outsole for extraordinary durability, protecting the foot while offering ultimate on-court traction. This is how you beat your opponent, amazingly. Further, it integrates the Flexion Fit technology that brings a proprietary upper design for optimized custom-fit stability and comfort. This is the best of tennis shoes for men you can get. No disappointments. 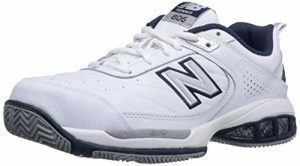 Tennis shoes for men come in different sizes and shapes and may feature different materials and designs. However, as aforementioned, not all offer the best foot protection and improved performance efficiency. You, therefore, need to know if your chosen model packs the right features for the best gaming experience, whether you are a beginner or a professional player. In that light, the above reviewed best tennis shoes for men deliver unparalleled performance on the court. They are not only comfortable and supportive but also durable for long-term value.